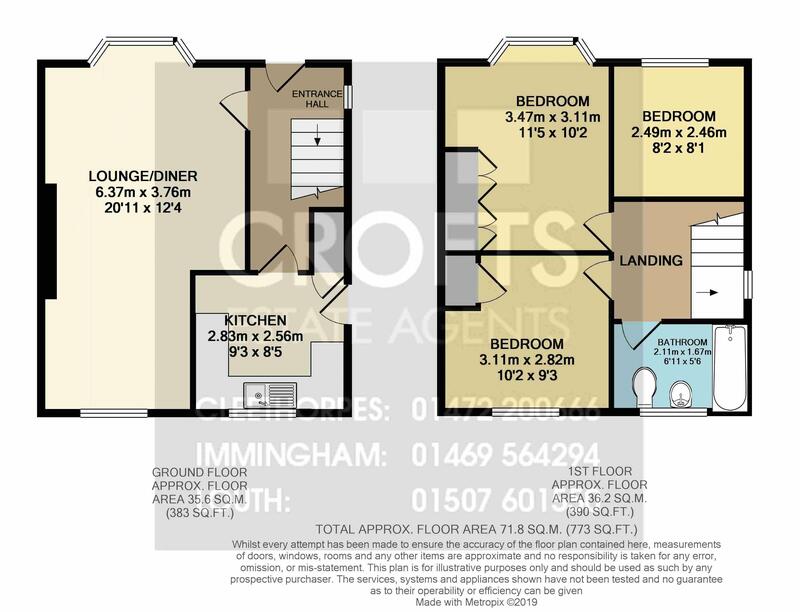 Crofts estate agents are delighted to offer for sale with NO FORWARD CHAIN this semi detached property which is located within the popular port town of Immingham. Requiring a scheme of modernisation this property is priced to reflect that and comes with viewing highly advised. Nearby there are local amenities, schools and bus and road links. Internal viewing will reveal the entrance hall, lounge-diner and kitchen to the ground floor. To the first floor there are three bedrooms and the bathroom. Externally there are gardens to front and rear with a driveway and garage and the property also benefits from uPVC double glazing and gas central heating. Entering into the property through the front door reveals a window to the side elevation, a radiator and carpeted floor. The kitchen has a window to the rear elevation, door to the side elevation, access to the under stairs cupboard, plumbing for a washing machine and fitted units with a sink and drainer. The first floor landing has a window to the side elevation and a carpeted floor. Bedroom one has a window to the front elevation, a radiator, carpeted floor and built in storage. Bedroom two has a window to the rear elevation, a radiator, carpeted floor and built in storage. Bedroom three has a window to the front elevation, a radiator and carpeted floor. The bathroom has an opaque window to the rear elevation, a radiator and vinyl flooring. There is also a three piece suite with a WC, basin and bath with electric Triton shower over. The garage has an up and over door and window to the rear elevation. To the front there is a low maintenance garden and then a driveway leading to the garage and rear garden. The rear garden has a lawn, patio area and established shrubs.